It’s that time of year again and St. Patrick’s day is just around the corner. 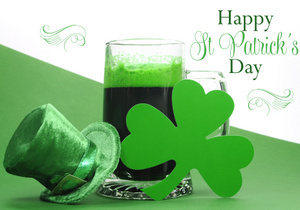 A day dedicated to the color green, the luck of the Irish, and of course beer (sometimes even green beer). On this most holy day dedicated the golden sudsy beverage that is beer, people across the nation will be clamoring for things to toast about, and reasons to raise their glasses. This year, why don’t you dedicate a toast to your teeth? Yes, that’s right, your teeth. At least the health and longevity of them because, believe it or not, recent studies have shown that hops, a common ingredient in all beer recipes, is actually good for your teeth. Hops, which are the flowers of a species of plant known as Humulus, is the ingredient which gives all beer the distinct flavor it has. However, beer has not always contained hops. The inclusion of hops into beer recipes started in 18th century England. During this time in history, everything was transported and exported by ship. This method of travel had the tendency to take a long time. A very long time. Because of this, people had to find ways to keep the edible and drinkable items they were transporting from spoiling. In beer’s case, the solution to its tendency to spoil due to a variety of bacterias was to add more hops! Batches of beer which had a higher content of hops in their recipe survived the long sea voyages without going rotten. This led to additional hops being added to conventional beer recipes becoming a requirement. Nowadays breweries, like Mountain View’s own Tied House, consider hops to be a critical part of their recipe due to the distinct taste it gives the finished product. However, scientists will always be curious and the mystery as to why hops kept beer from spoiling plagued biologists around the world. That is, until 1937 when antiseptic properties were first witnessed in hops. Fast forward 80 some year and scientists, the brilliant and persistent breed they are, have narrowed down what amazing things certain extracts in hops do for our bodies. Lupulone, for instance, is a menace to tuberculosis. Another component in hops, known as xanthohumol, kills viruses and contains anti-malarial properties. But this next discovery has made dentists around the globe jump for joy and given the staff here at Smiles By Design a real reason to raise a mug this St. Patrick’s day. For years dentists have been hoping and searching for a natural method of preventing gum disease; one of the most common oral diseases seen in adults and children alike and a direct cause of tooth decay. Gum disease is a disease that affect the soft gum tissue that protect and wraps around teeth, and it is caused by bacteria. Gum disease leads to gum recession, and gum recession leads to the roots of teeth being exposed to bacteria. When the soft roots of teeth, which are covered in a delicate substance called cementum, are exposed to bacteria, decay isn’t far behind and rest is just a slippery slope of cavities and painful root canals. However, dentists are scientists too, and when antimicrobial properties were seen in hops dentists decided to give hops a shot at benefitting the human mouth. What they found is that hops are not only good for your oral health, acting like a type of tasty antimicrobial mouthwash when consumed in beer, but they can also help to prevent oral problems and tooth decay in your mouth’s future! Huzzah beer! This information was first given spotlight in 2008 when a team from Osaka University discovered polyphenols, a type of chemical known to prevent oral cancer, in hops. Tests showed the compounds in polyphenols stop inflammation in the gums and help to keep them the healthy, light pink color they are supposed to be. Another team from Nippon Dental University discovered the very same year that these same molecules threw a real wrench in the production of plaque, nearly stopping it. And remember xanthohumol? The compound that kills viruses and fights malarial activity. Well by 2013, this universal and seemingly biological superhero bent on fighting for the human race, was discovered to be a boon for teeth as well. For some reason, xanthohumol prevents bacteria from sticking to your teeth and gums, the way beads of water fall off a duck’s feathers. Who would have thought that all these benefits could be found in the tiny flowers thrown into beer recipes just to keep it from spoiling? On top of all this, they are pretty tasty! So this St. Patrick’s day, impress your friend’s by raising a glass to polyphenols, xanthohumol, and dentists across the world, all of whom are working in tandem to protect your pearly whites. Just be sure to drink responsibly. Remember, no matter it’s benefits, there is always such a thing as too much of a good thing. And if by chance you already have a cavity, or gum disease, fear not. Smiles By Design can take care of any oral problems you have, getting your mouth healthy again in time raise a toast on March 17th. Cheers fellow teeth enthusiasts and remember to smile!